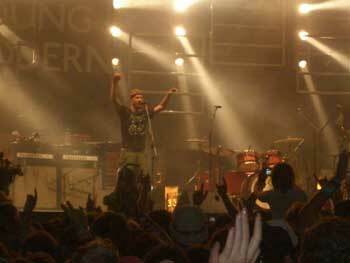 Around 21:15, Eskimo Joe had finished their set and Silverchair's road crew began setting up their equipment. 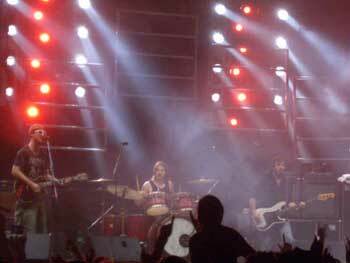 A Young Modern sign and what looked like gates or barriers were tied to a chain and hauled up over the stage. 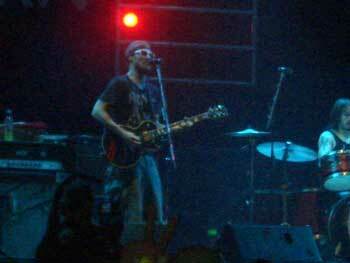 Around 21:40 the crowd started cheering for Silverchair. And at 21:45, the lights went out and music started playing from the speakers. It was a kind of slow beating, like a beating heart, and it got faster and louder. The boys came on. Silverchair hit the stage and opened up with a stripped down version of Emotion Sickness, but it was still great. Daniel's vocals were great. He hit every note, and some of the notes he DID hit were absolutely amazing. He's really gotten back into shape. They followed that with The Greatest View. Im starting to think they wanted to open up with heavier, more lively songs to get the crowd going. The last two notes Daniel sang during TGV were superb. Really something. The brass section of course played the melody. They then played World Upon Your Shoulders, which was cool, and in the solo, the brass section took over made it sound like the song was slowing down. They'd play a note and let it slowly ring out. Daniel then said "We're gonna take you to the future. 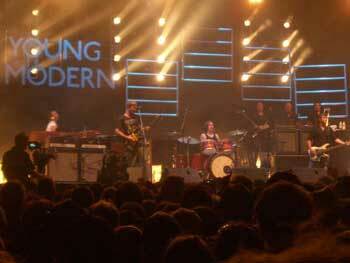 Next stop, Young Modern Station" and they played Young Modern Station. As far as a description goes, it's a very upbeat, happy song, which you can dance to. When Daniel said he wanted to write songs people could dance to, well, he wasn't lying. For those who know their drumming, Ben played 16ths. The guitar riff is kinda heavy, and in the intro he'd play it, then hit the delay and it just had this really, really heavy delay there. The guitar was so distorted you could barely hear the tone. Its a fast song, and the lyrics are crazy. I'd probably compare it to Thinking In Reverse by the Dissociatives, but in a Silverchair way. Anywho, next song they played was Anas Song. The Whole crowd sang along to it. It was beautiful. They didn't do it as heavy though, and they slowed it down a bit. Ok, one thing i have to say. Daniel's pedal-work is back to the way it was. During WaveAid/TGE etc, i think he'd forgotten how to use his pedals or something, as he missed his cues or whatever, but last night, his effects were perfect. He did everything well. Another thing that has improved again is that at TGE, he sometimes played wrong chords or forgot how parts of songs went. Last night, he played EVERYTHING perfectly. Anywho, after Anas Song, they played Straight Lines. Im very happy with myself. Thanks to miscellaneous bootlegs from previous shows, i knew ALL the words to the new songs other than Young Modern Station and the new part of Mind Reader. So i think i was the only one singing during Straight Lines. Anyway, the new version is absolutely beautiful. There's a short piano part in the intro, and then it breaks into the first verse. They've changed the arrangement around heaps. The first chorus comes in later then it did in the other version, the second chorus comes in earlier (on the off-beat), the last chorus again comes in later, and the bridge has been changed completely to what you could say is a brass instrumental. After that, Daniel pulled out his green Paul Reed Smith. I knew straight away what they were gonna play. Daniel said "Now we're gonna play some old-school Silverchair" and started playing The Door. It was again a stripped down version, but he still managed to have quite a guitar solo in the middle. His vocals were great here, and he improvised some of the singing. Paul was on the side of the stage dancing while having a smoke during. They then followed that with Mind Reader. A completely new version of Mind Reader. It sounded like a different song. First of all, it didn't start with bass and drums, it started off with guitar. A lot more heavier. The chorus has changed too. They added a new extra four bars to it, with brand new words. The first chorus hasn't got the "Don't know what you want..." part, it just goes straight into the 2nd verse. After the 2nd chorus, which DOES have the "Don't know what you want" it goes to the bridge, which again is completely new. In the original one, they all stopped playing and Daniel sang four lines. In this version, he sings one line, and then it's instrumental, before Daniel sings the fourth line and then they go into the last chorus. They followed that with Luv Your Life. Daniel got the crowd to sing the chorus after the first "Do do's" and everyone was singing. Again, it was beautiful. Afterwards, they played Across The Night, which i have to say was the best version of Across The Night i have EVER heard. Vocals were great, and Ben played a different drum break before the 2nd chorus. Daniel then changed guitars, grabbing his Fender Telecaster Custom out, and playing a very heavy end. His guitar work at the end of Across The Night was great, as he was playing all these licks and other stuff. Terrific. Daniel went to change his guitar, but then plugged it back in and said to the crowd "I forgot i don't need to change guitars there. Im so used changing em." They then played If You Keep Losing Sleep. The arrangement has changed a bit, but overall, its still the same song. They've taken away the first chorus. The song got a great reception. Afterwards, Daniel said "Yeh, we'll see you in the charts." He then said "Ok, this song isn't ours, but you might know it, from a previous performance, such as, say, the 2006 ARIA Awards." And they started playing Don't Wanna Be The One. We all sang along. Daniel brought out his Les Paul, and they played Without You. Daniel's vocals were spot on again, and the music sounded great. They played Freak, and the crowd was moshing. It was great. Very heavy. Last song was The Lever. It was absolutely brilliant, and Daniel's vocals again were amazing. At the end, he threw his guitar around for a while before taking off. The crowd waited around for a while to see whether they'd come back on, and they didn't, so that's that.